Extensive and conclusive analysis debunking the Meier/ET’s claims on the 5,105 year old mummified body of a man discovered in the Ötztal Alps on the border between Austria and Italy, in September 1991 was published in 5 parts on Mahesh Karumudi’s personal blog: Part 1, Part 2, Part 3, Part 4 and Part 5. ..The fact that babies may suffer very serious health impairment when the mother is a smoker, has already been known to terrestrial scientists for some time. The fact, though, that a father’s tobacco addiction can harm his offspring’s health, still remains completely unknown. Even if the parents were to stop smoking at the time of their child’s conception, the baby could still experience severe health impairment. To widely exclude any impairment of their offspring’s health, parents would have to refrain from vice and addiction at least 18 months to the child’s conception. They would have to be careful at the same time to abstain from smoking until the moment of birth, for giving in to the urge in the interim even once would jeopardize everything. Simply one cigarette would cause as much damage to the tobacco addict’s health as though he or she had never stopped..
Michael Horn cites a 2007 report that indicates that children could inherit genetic damage from a smoking father, as evidence of Meier’s prophetic ability or contact with ETs. Ironically Meier/FIGU cites a 1994 report (see above table) suggesting the same. In any case, is it true that our scientists were completely in the dark on the connection between father’s tobacco addiction and offspring’s health? And is Meier the first person to announce or publish this information in 1992? The answer is no, not even close. AMID disputed reports that the sperm count of American men is falling, scientists are finding that a wide variety of environmental and industrial chemicals can interfere with the normal development of sperm and possibly cause birth defects and infertility. While past studies have focused almost exclusively on the mother’s contribution to fetal malformations and other pregnancy abnormalities, it is now becoming increasingly clear that the father may also play an important role in pregnancy mishaps. In addition to DBCP (dibromochloropropane), substances that have been shown to damage human sperm development include the pesticide Kepone, lead, marijuana smoke, large amounts of alcohol and radiation. There is also evidence that the pesticide carbaryl (Sevin), the hormone diethylstilbestrol (DES) and tobacco smoke may interfere with the normal development of human sperm. The result may be reduced numbers of sperm, improperly shaped sperm, abnormal sperm movement and genetic abnormalities in the sperm cells. An increased rate of miscarriages or stillbirths has been observed among the wives of dentists who use the anesthetic nitrous oxide, workers in a lead-arsenic smelter, applicators and formulators of DBCP, heavy cigarette smokers and radiation workers. Damage May Be Inherited. It is clear from the above article citing multiple studies, that the link between father’s tobacco smoking and offspring’s health was already known and suggested by scientists at least by more than a decade before the time of the alleged conversation by Meier with ET. So the ET’s claim that this connection was ‘completely unknown’ among earth scientists is ridiculous. Another question: it happens very often that smaller and larger chunks of ice fall from the sky, with some clearly coming from airplane toilets, when these are mixed with feces. But others must be of another origin. Every now and then, there are also some genuine pieces of hail, where the individual pieces are often very large. Indeed, hundredweight pieces and even larger pieces fall to the Earth every now and then, and the scientists and also the laymen cannot explain the origin of these pieces of ice. We already talked about this in 1975, when you explained to me on the Great Journey that these are ice meteors that penetrate individually or as entire swarms into the earthly atmosphere and fall to the ground, without them dissolving, respectively melting, during the downfall. In addition, the question: does this explanation possess general validity, apart from the pieces of ice from airplane toilets? 37. Apart from the pieces of ice, whose origin is to be found in aircraft, all other pieces of ice are those that drift through free space and arrive into the gravitational field of the Earth, where they then crash down upon the planet. That they have esoteric factors and must be regarded as such falling pieces of ice and, perhaps, as even coming from another dimension and falling down upon the Earth, as esoteric people and other believers in ghosts maintain, this has no veracity, right? 38. Certainly not, for these assertions are esoteric fairy tales. Chinese experts, saying it could be a scientific first, have recovered what they believe to be chunks of meteoric ice that plummeted to earth in Zhejiang province, Xinhua news agency said. No ice meteorite has ever been verified by scientists before, Wang said. If confirmed, the meteoric find would be China’s second major scientific triumph this year. Experts are viewing what portends to be the world’s first recovery of an ice meteorite with excitement and caution. The largest chunk, now about the size of a fist, left a crater about one metre (3.3 ft) in diameter and a half metre deep. The second piece was a bit smaller, Xinhua said. Wang, a member of the International Meteorite Council, cited strong evidence that the ice chunks were from a meteor that crashed from space into the earth’s atmosphere. For more information on ice meteorites, read these papers from 1997, 2001, 2001 and 2006. Current scientific consensus is that there is no ice meteorite found anywhere on earth, though the possibility of its existence is thought to be not impossible. As you can see the anecdotal reports on the existence of ice meteorites goes back more than a century and even an article in 1995 reporting the possible recovery of an ice meteorite was published 3 years before Meier published the contact report for the first time in Semjase Kontakt Berichte, 2nd ed. Vol 14. So, if one day ice meteorites were conclusively identified by scientists to have survived the atmospheric entry and impact with the Earth’s surface, we have shown that Meier is certainly not the first person to have announced it. As you wish, then in the future, I’ll let such questions be. But otherwise, can you tell me when, approximately, the first flowers bloomed on Earth? 56. I don’t know that exactly, but it should have been about 450 million years ago. Can one, perhaps, still find any fossils of these? 57. The oldest fossils of flowers discovered by us on the Earth are 308 million years old. The first vascular land plants — plants with special tissues to efficiently transport water, minerals and food — appeared in the Ordovician period, around 450 million years ago. But based on Ptaah’s information, flowering plants then must have existed alongside the non-flowering land plants – which outright contradicts the scientific consensus that flowering plants have evolved from the non-flowering plants over several million years. Also according to the recent 2013 study, flowers which are modified leaves possessed only by the angiosperms, relatively appeared late in the fossil record around 240 million years ago, a little bit more than half the age of land plants. So what the ET Ptaah suggested is again at odds with the current scientific evidence. Nevertheless, Michael Horn, for some unknown reason, cites the 2013 report, as “evidence” of Meier’s prophetic ability or contact with ETs, when the evidence obviously contradicts Meier’s own claim. ..On a broader scale, expect a coup involving the USA and its president, in the year 2003, in March, which will stun the entire world. Additionally, lengthy deliberations will increasingly take place regarding Islamic fundamentalism, which will mesmerize the entire globe…The danger of accidents in nuclear reactors will increase throughout the world. Regarding this subject, France in particular must be extraordinarily careful in every way, for one prophecy warns of a strong probability for an accident near Lyon, which can be prevented as long as the responsible individuals undertake the right steps – a prophecy can be changed…. However, as bad as they may seem, these periods are not as unstable as that of 1995, a year when new discoveries on Mars are possible; and a year when the seeds of a new ideology are sewn that sets it apart from traditional religions. 1995 will also be a year when an unknown, powerful male individual begins to come into prominence who spellbinds the world and gathers followers around him in much the same rat-catching manner as the Pied Piper of Hamelin. For this reason, in one prophecy, he is called the rat-catcher. These events coincide with many innovations and discoveries in technology and science; for 1995 and the ensuing years bring incredible breakthroughs that will change civilization. One contributing factor to these breakthroughs in the near future will be, finally, the exposure and rectification of an error in the Pi-number calculation..This will signal the first threat of a looming third world war, as foretold by a prophecy, unless terrestrial Man strives to avert this danger through reasoning and appropriate thoughts and actions. Should Man fail to act against the fulfillment of this prophecy, a new and extremely destructive weapon will be built that will produce disastrous consequences in the next world war. One important factor in this scenario is the criminal neglect to monitor the Earth from space. New weapons will once again create quite a stir, and so will the death of 4 heads of state who will die within 7 days from each other. These then are the last danger signs, which foretell that within merely 2 years of these events the long-feared world war will indeed erupt, unless terrestrials finally gain mastery over their reasoning to stop all these ills. Should this not be done, mankind will fail in its attempt to protest and boycott the new deadly weapons, because by this time the armories of many nations will be full to their capacity. Passing laws to prohibit the use of these weapons will be ineffective at this late stage. World War III cannot be averted if Man fails to finally become reasonable! The prophetic or predictive information from this CR 251 is so vast to list them all here in detail. Most of them talk about events that are several years or centuries or even millennia into the future. So for our analysis, we have just chosen those excerpts that are relevant and testable for our investigation. Something else in this regard: I have been thinking that while redoing and correcting the PROPHECIES (BMUFOR Note: a book which was later published in 1996), we could also incorporate the 23 pages. There are actually only one or two prophecies, the remainder consists of predictions. Although one prophecy states that extraterrestrials will officially land on Earth on June 5th, 1995; a second prophecy predicts this event for 1998…Regarding this subject, France in particular must be extraordinarily careful in every way, for one prophecy warns of a strong probability for an accident near Lyon..A new hording of weapon stockpiles will follow at a time when the worldwide production of weaponry is accelerated once again. This will signal the first threat of a looming third world war, as foretold by a prophecy, unless terrestrial Man strives to avert this danger through reasoning and appropriate thoughts and actions. Should Man fail to act against the fulfillment of this prophecy, a new and extremely destructive weapon will be built that will produce disastrous consequences in the next world war…1995 will also be a year when an unknown, powerful male individual begins to come into prominence who spellbinds the world and gathers followers around him in much the same rat-catching manner as the Pied Piper of Hamelin. For this reason, in one prophecy, he is called the rat-catcher. Below are some of the excerpts taken from Billy Meier case Representative and FIGU Passive member Michael Horn’s articles that appeared in MUFON Journal, FIGU website and also from his own website respectively on the alleged corroboration of USA attack on Iraq in 1995 and 2003. All Randi could offer was a comment about how a “child” could “see through the farce” and his own claims that Mr. Meier never published any prophetically accurate information! In February of 1995, Meier published a lengthy document of enormous complexity in which he foretold the likelihood of certain specific future events. In September 2001, portions of that information were included in the book “And Yet They Fly!” written by Guido Moosbrugger, an Austrian former schoolteacher and principle acquainted with Meier for about 25 years. 1. The strike or attack by the US and its president (Iraq). Meier even used the word “stun” when he said the strike would “…stun the entire world…” “Stun” is a synonym for the term “shock” used by the US as in “shock and awe”. .. The prophetic information provided to (and published by) Mr. Meier for the past 30 years has proved to be impeccably accurate. As an example, he preemptively published, in both 1995 and 2001, advance warning of our recent attack on Iraq, along with numerous other specific events, which were likewise recently fulfilled. Before you consider the prophetic information below, please note that from his 251st Contact on February 3, 1995, Meier published advance warning of the US attack on Iraq, the increase in Islamic terrorism…All of this information and more from the 251st Contact was also published in Guido Moosbrugger’s book, And Yet They Fly!, in September 2001—well before any of the foretold events occurred. Did Meier really publish ‘USA attack on Iraq in March 2003‘ before the Iraq war of 2003? 189. Im weiteren ist von den USA und von dessen Präsidentschaft ein Schlag zu erwarten, der die gesamte Welt vor den Kopf stossen wird..
Im weiteren ist von den USA und von dessen Präsidentschaft ein Schlag zu erwarten, der die gesamte Welt vor den Kopf stossen wird..
On a broader scale, expect a coup involving the USA and its president, which will stun the entire world. On a broader scale, expect a coup involving the USA and its president, in the year 2003, in March, which will stun the entire world. On a broader scale, expect a strike involving the USA and its president, which will stun the world. 189. Im weiteren ist im Jahre 2003, im März, von den USA und von dessen Präsidentschaft ein Schlag zu erwarten, der die gesamte Welt vor den Kopf stossen wird..
No mention of the country Iraq anywhere in the above prophecy. The first mention of the beginning of the Iraq war (month and year) was only made in June 25, 2003, i.e. 3 months after the Iraq war was already started in March 2003 (See FIGU USA Website, June 25, 2003). These three findings irrefutably indicate that Meier never prophecized or predicted the Iraq war to occur in March 2003, as was vehemently maintained by him, FIGU and Michael Horn. Auch die Gefahr von Kernreaktorunfällen steigt, und zwar rund um die Welt. Für die nächsten Jahre sollte besonders Frankreich in dieser Beziehung alle erdenkliche Vorsicht walten lassen, denn eine Prophetie warnt vor einem GAU bei Lyon, der verhütet werden kann, wenn die Verantwortlichen die richtigen Schritte unternehmen, denn eine Prophetie ist ja änderbar. Also, the risk of nuclear reactor accidents will increase, in fact throughout the world. Over the next few years France in particular should take all possible precautions in this regard, because a prophecy warns of a “maximum credible accident” near Lyon, which can be prevented when those responsible take the correct steps, since a prophecy is changeable. The first sentence is not specific and open-ended, meaning there is no cut-off date for a statistical analysis. As more nuclear reactors get built the number of accidents would also naturally increase. However if we were take the cut off date as 2007, then the number of major nuclear accidents have indeed decreased between 1995 (time of Meier’s prophecy) and 2007. 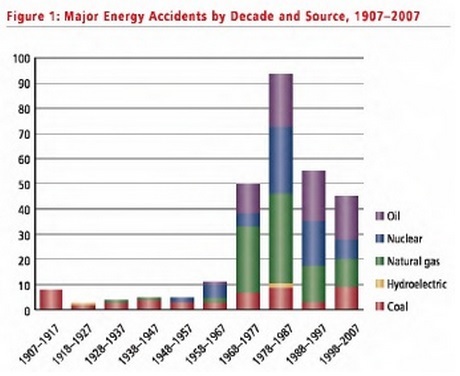 Following is the graph documenting major energy accidents by decade and source between 1907-2007, which shows the decrease in nuclear power plant accidents. The second sentence has a specific location- Lyon, France (Bugey Nuclear Power Plant) – but no mention of any date or year and also no mention on the seriousness of the accident, thus making it too open-ended, meaning, this prophecy can run indefinitely and we cannot verify whether that particular (major or minor) accident in any year was the same accident that Meier specifically prophecized in 1995. Moreover, it was said that this accident does not have to happen 100% but can be averted; which makes any alleged claim on the fulfillment of the prophecy, worthless for investigation since it cannot be falsifiable. 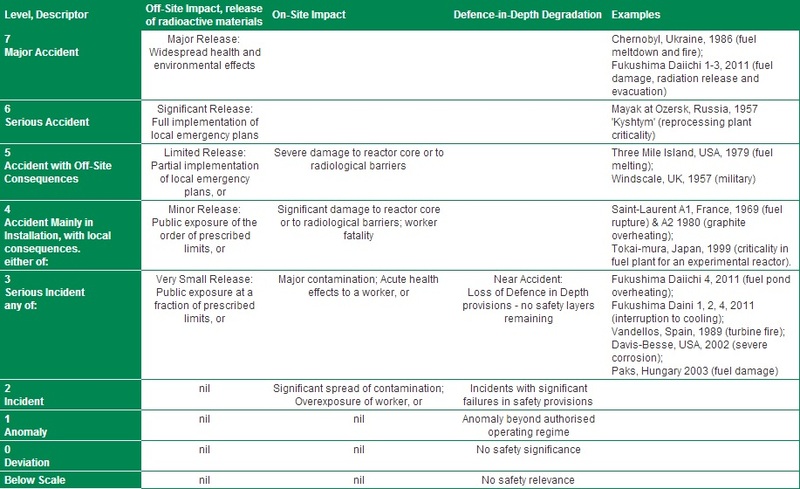 The International Nuclear Event Scale (INES) was developed by the IAEA and OECD in 1990 to communicate and standardize the reporting of nuclear incidents or accidents to the public. The scale runs from a zero event with no safety significance to 7 for a “major accident” such as Chernobyl. Three Mile Island rated 5, as an “accident with off-site risks” though no harm to anyone, and a level 4 “accident mainly in installation” occurred in France in 1980, with little drama. Another accident rated at level 4 occurred in a fuel processing plant in Japan in September 1999. Other accidents have been in military plants. So what level of accident was Meier talking about? Do we have any clues? Meier used the phrase – ‘extraordinarily careful‘ – to describe the accident, which is not at all helpful in isolating the accident. France (58 reactors) is the 2nd country next to USA (100 reactors) in having the most number of nuclear reactors and so any nuclear incidents or accidents is very likely to take place in France than all the other countries, except USA which of course has the most nuclear-related accidents. Benjamin K. Sovacool has reported that worldwide there have been 99 accidents at nuclear power plants from 1952 to 2009 (defined as incidents that either resulted in the loss of human life or more than US$50,000 of property damage, the amount the US federal government uses to define major energy accidents that must be reported), totaling US$20.5 billion in property damages. Fifty-seven accidents have occurred since the Chernobyl disaster, and almost two-thirds (56 out of 99) of all nuclear-related accidents have occurred in the USA. There have been comparatively few fatalities associated with nuclear power plant accidents. 7. Meier specifically warned of the possibility of an accident, one that he said could be avoided, however, at the nuclear power plant near Lyon, France. The emergency scenario, and the timely shut down of that exact plant, occurred on August 12, 2003. Bugey Nuclear Power Plant is the only power plant that is near to Lyon and has 5 nuclear reactor units out of which one reactor unit was already shut down on May 27, 1994. On the skeptic Derek Bartholomaus website, he has shown that the claim by Michael Horn on the 2003 event does not fit into the prophecy. Also they have commented on another claim made by Horn in his 2007 documentary, The Silent Revolution of Truth (@12:45 min in ‘The Skeptic’ section), where he cited a 2000 year article – EDF to Make Repairs at Nuclear Plant After Design Error Found – which talks about design flaw (INES level-1, the lowest ranking on a scale of 1-7 ) that has been detected in Bugey-2 ASG & PTR tanks and has nothing to do with Bugey-1 reactor as argued by Derek. More information on the 2000 event can also be read here – Wikipedia and ASN (Nuclear Safety Authority of France). Is this 2000 incident the one Meier prophecized? Discovery of the design flaw was classified a level-one incident, the lowest ranking on a scale of one to seven, EDF said, adding that there are several dozen level-one incidents each year. We were unable to find any notable discoveries made on Mars by the scientists in year 1995. Unless more specific details are given, we cannot say for sure if such and such person is the one whom Meier was talking about. Is it suggesting that this male person spellbinds the world in year 1995 or that this male person, though begins to come to prominence in 1995, only spellbinds the world and gathers followers around him only much later? In either case, any televangelist, cult leader, channeler, guru…etc can be made to fit into this prophecy. Michael Horn in 2005, presents the suggestion made a person named Chris Lock on his website that Shoko Asahara – founder of the Japanese new religious group Aum Shinrikyo who was convicted of masterminding the 1995 sarin gas attack on the Tokyo subway and several other crimes, for which he was sentenced to death in 2004; and in June 2012, his execution was postponed due to further arrests of Aum Shinrikyo members – would be pied piper which Meier was referring to. At the same time FIGU passive member Achim Wolf on FIGU Special Bulletin 46 (Dec 2008) wrote an article – Der Rattenfänger – which either means The Rat Catcher or The Pied Piper. In that article, he seems to suggest that George Bush Jr. was the said pied pier. So who is right ? For more deconstruction of this pied piper prophecy, visit Mahesh Karumudi’s personal blog page. Mathematicians or scientists have not made any suggestions, even remotely, on the alleged error in Pi-number calculation. Instead, the value of Pi was precisely calculated to a world record of whopping 12.1 trillion digits in Dec 2013. Yeah, you see, I got several prophecies and all of them they speak from WW III and this WW3 will be for sure. It will be for sure! Absolutely sure! It isn’t changeable. Will this be by accident or will it be through human stupidity or what? No, by some foolish people who likes to come to power. Will this be started by the east or by the west ? You know its a very funny thing. It will be started in the east and it will be started in the west and its started too in the north…. All at the same time ? Meier was so certain about the imminent WW 3, that according to the investigative journalist Balz Theus (Meier. Prophet – oder Die Sehnsucht nach einer besseren Welt, pg. 200, 1987), a person from Winterthur came to inquire Meier who by then has advertised in his periodical – Stimme der Wassermannzeit – for donors who would fund the construction of a nuclear bomb-proof shelter that could house 150 people. How many other people have responded to Meier’s advertisement and the total donation amount, if donated in the first place, is unknown to us. I have a question regarding WWIII. In a 1982 English interview with Bob Zanotti (I am not sure if you remember this because I think this was before your collapse), you said in the last three minutes emphatically that WWIII was inevitable, and that it was going to happen, no matter how hard humans tried to avoid this. You also said that WWIII would start before the beginning of the year 2000, which obviously didn’t happen. My question is: Did this delaying of WWIII have anything to do with the Peace Meditation? In 1982, I think there was no Peace Meditation present, and hence your dire prediction. Has the installation of the Peace Meditation delayed the onset of the Third World War, and can it possibly be prevented thereby? Thank you. Have a wonderful day. Salome. The shock of that near-outbreak of WWIII had stirred quite intense waves in certain governmental and military circles and brought about some change of thinking regarding the „cold war“ and nuclear missiles etc. etc. Ultimately this led to an end of the „cold war“. When did Meier first mention the role of Russian officer Stanislaw Petrow in averting WW III? In FIGU Special Bulletin 67, where a report from the recent contact (CR 537, March 3, 2012) with ET was published in May 2012. Why didn’t Meier mention anything on the 1983 incident before it was declassified and revealed to the broad public in 1998 upon the publication of Votintsev’s memoirs? WW III was mentioned many times in contact reports since 1980’s but the 1983 incident was only mentioned in 2012. For Meier case supporters, the answer could lie in the fact that sensitive classified information closely guarded by nations and governments would never be released by Meier, as mentioned here. On the other hand, the opposite camp would claim that this is a classic example of retrodiction. When the WW III was prophecized by Meier in early 1980’s to be absolutely sure and when it didn’t happen, normally anybody would expect that Meier would have offered some reason as to why it was averted when it was deemed unchangeable. Strangely he didn’t give any reason, at least publish any reason officially in his publications until 2012. One interesting note here is that Meier in CR 246 (1993) stated that peace meditation had a certain role in averting the threatening world war III in mid 1980’s. You promised to tell me the size of Comet Hale-Bopp once you’ve measured this. 240. The comet has an oval shape and measures 38,432 meters in its extreme length and 36,781 meters in its width, in rough measures. So not to the exact centimeter. Although comets are extended objects to the eye, the source of the cometary activity is the icy nucleus whose typical size is of the order of 10 km. Astronomers have assumed that the large amount of coma activity and corresponding total brightness, meant a larger-than-usual comet nucleus for the Comet Hale-Bopp (C/1995 O1). But the estimates made by comet scientist Zdenek Sekanina of the NASA’s Jet Propulsion Laboratory suggest that the activity need not require a nucleus larger than 10-15 km in size. However analysis of Hubble Space Telescope (HST) images of comet Hale-Bopp in March 1997 suggested that the effective diameter of the nucleus might be between 27-42 kms or 30-40 kms. But later analysis indicated that its comet nucleus must be 60±20 kms in diameter. Also see this NASA website mentioning a nucleus measuring approximately 60 km (37 miles) in diameter. One other interesting note here is that the values used by Meier for his supposed 260th contact with ETs is totally within the acceptable range predicted by scientists at that time (also see the German news article from 1997 in the above table), which however were turned out to be inaccurate in later studies. How can an advanced ET’s estimation of the size (kms) of a comet, whose measurements are “accurately” given down to three decimals, could go so wrong? ..Here, however, I have to ask something else: solariums: a lot of advertising is constantly made about the solarium business, and it is maintained that the use of solariums is healthy and harmless. You and Quetzal, however, once said something else. What must one now actually think of solariums or of letting oneself be irradiated? 255. The assertion that the use of solariums and letting oneself be irradiated are healthy and safe is not only wrong but also life-threatening, even if this seems implausible to the Earth people on the first impression. 256. Solariums produce increased UV-A rays that, on the one hand, make one addicted and, therefore, dependent and, on the other hand, penetrate deep into the skin and into the body, making this and the organs damaged from within with a lasting effect and causing internal tumors, etc., such as, above all, cancer. 257. However, the likewise active UV-B rays, as these are also released by the Sun’s rays, work in another way and are limited in their effect to the outer layers of skin, on and in which they cause sunburn and skin cancer. But unfortunately, all this is not yet understood by the earthlings. 258. At least a very large part of the Earth people is actually inconvincible in this respect, which is why very many must experience and get to know the effective evils of the solar radiation and solarium radiation on their own bodies and often pay for it with their own lives. A very unfortunate and true statement. The conversation between Meier and Ptaah does seem to suggest that they were addressing majority of the population who do not take action against the negative effects of solariums or sun beds or sun booths, and not the experts who by the time of the conversation have already been publicly warning about the dangers involved. Solarium owners have been accused of failing to warn their customers that they may be risking skin cancers, premature aging and eye damage…There also was some evidence that people who used solariums regularly might become “addicted”, as repeated short exposure might trigger the release of hormones called endorphins, which produce feelings of well-being. See this Wikipedia article – Tanning Addiction – for more information. Despite these widely circulated warnings published in the media at least a decade before Meier’s supposed conversation with the ET, Michael Horn cites articles from 2004, 2009 and 2010 as evidence of Meier’s prophetic ability or contact with ETs. And are further such occurrences to be expected? 21. Undoubtedly, for mega seaquakes like this, through which enormous tsunamis arise, are already being created. 22. Probably, the largest one will also occur in the northwest pacific – in addition to more in Indonesia. You are again sparse with information and explanations. 23. According to our forecasting abilities, there will arise though a seaquake of strength 9 on the Richter scale, in the area of the north Pacific not far in front of the American coast, from Portland and in the south California, up to Washington in the north, a gigantic fault of several hundred kilometers, as a result of which an, up till now never to have occurred there, seaquake tsunami breaks out in ring form and causes enormous destruction to the mainland and to islands and will claim many human lives. 24. The seaquake will last around 5 minutes long, after which then many further and smaller quakes follow and also even a smaller tsunami is released. 25. Some facts concerning this threatening danger are known to Earth scientists, but they are unable to grasp the actual threatening catastrophe. I can understand this myself, for our scientists are, as a rule, narrow minded and moreover live with incorrect ideas. Now tell me, when will this monstrosity occur? 26. It will occur on …, however, about which you have to keep silent. It goes without saying, my mouth is sealed. Thanks for the information. Michael Horn cites a 2008 report suggesting that Meier’s prediction on a mega 9.0 earthquake in the pacific northwest was corroborated by scientists 3 years later after he first published it in 2005. In his article, Michael also writes that the Oregon scientists, who published that report, ‘don’t foresee a tsunami and have a lower estimate (6.5 to 7.0) of the magnitude of the quake than Meier.’ If one takes a look at what the 2008 news report says, it would be evident that Michael Horn hasn’t even read the report, which he in his ignorance uses to support his claims. The 2008 study is just talking about the Blanco Transform Fault Zone (located 200 miles off the southern and central Oregon coast), which they say is more active than the San Andreas Fault in California and an earthquake of magnitude 6.5 to 7.0 is probable in the near future. This however has no bearing upon the mega earthquake predicted by scientists in the pacific northwest because of the building up of stress in the Cascadia subduction zone. These are entirely two different regions/causes. Until the early 1980s, Cascadia subduction zone was thought to be benign by most scientists but then a swift series of discoveries in North America showed that the fault produces earthquakes of magnitude 8 or larger at irregular intervals, averaging about 500 years. Having said that, now is Meier the first person to publish warnings on the impending mega earthquake and ensuing tsunami in the pacific northwest? As it turns out, NO! There are papers going back into 1980’s and 1990’s (see references) talking about – several great earthquakes (and the ensuing tsunamis) from the subduction zone between the Juan de Fuca and North America plates, and also about the probability of the impending great earthquake with the magnitude of 8 or 9, in the pacific northwest. Also check out this 1989 news article – Huge earthquake predicted: Could rock Pacific Northwest – published 16 years before Meier published the information. Then another subject: during the last few years, nanotechnology was very far developed on the Earth, whereby more and more, various nanomaterials find their use in all kinds of things that are used every day. In addition, you once said that nanoparticles are health-hazardous to people. What must one understand by this? 48. Nanoparticles of various kinds are extremely harmful to health if they enter into the respiratory organs and, thus, into the lungs. 49. In particular, this can happen via fabric and other materials that are treated with nanoparticles and that break away from the materials and float through the air, after which they are inhaled by the person. 50. However, this inhaling of nanoparticles is in no way harmless because they are so detrimental to the health of the human organism, as this is the case, for example, with asbestos particles, which also cause life-threatening diseases. 51. This is a fact that, unfortunately, has not yet been recognized by the earthly scientists and which can cause serious, health-impairing consequences for many people if the facts are not recognized soon and countermeasures are taken. That will probably still take its time, even if we distribute your warning worldwide. On the one hand, our scientists are severely narrow-minded, and on the other hand, an economic commerce has already been behind everything, such that the matter is still too difficult to stop. Nanotechnology is the manipulation of matter on a near-atomic scale to produce new structures, materials and devices. This technology promises scientific advancement in many sectors such as medicine, consumer products, energy, materials and manufacturing. Nanotechnology is generally defined as engineered structures, devices, and systems. Nanomaterials are defined as those things that have a length scale between 1 and 100 nanometers. At this size, materials begin to exhibit unique properties that affect physical, chemical, and biological behavior. According to the wikipedia information on Nanotoxicology and also from the report published in 2006 by Scientific Committee on Emerging and Newly Identified Health Risks (SCENIHR), there are studies done on the toxicity (lungs, intestines, skin,..etc) of nano particles going as far as back to 1990’s and even much before. See this report – Nanoparticles – known and unknown health risks – published in 2004 in Journal of Nanobiotechnology. Also refer to this link for several studies done well before 2006 that showed the toxicity of nano particles. So it is totally incorrect to suggest that the negative effects of nano particles were not at all recognized by scientists by the time of Meier’s conversation with the ET supposedly in the year 2006. Then another question regarding the Neanderthals, of which ever more bones were found during the last years and decades. Generally it is said that they disappeared from Earth when the so-called modern human being, homo sapiens, appeared. Until now it is totally unknown why the Neanderthals have disappeared. It is also not known whether they interbred – at least partially – with the modern human beings. 135. It was indeed the case that in the most various locations the modern human beings interbred with Neanderthals and begot offspring. 136. This however was not the rule, but occurred rather sparsely. 137. As a rule, the modern human beings hunted the Neanderthals and killed them, to use them as food, because the early homo sapiens were cannibals, and as such they by and by wiped out the Neanderthals. 138. Partly, the modern human beings held Neanderthals as captives, which they killed and ate in case of need for food. Such captives were also used, on certain occasions, to perform sexual acts with the homo sapiens, and indeed with both sexes. 139. As a result, also certain female Neanderthals and homo sapiens bore hybrids as offspring, which, however, was not often the case. Michael Horn points out that three scientific studies (however cites only the 2011 study) that looked into human-neanderthal interbreeding hypothesis have confirmed it only after Meier published about it in 2008, thus supporting his claim that Meier may have been in contact with ETs. However, the Danish geographer and ethnographer, Hans Peder Steensby, while strongly emphasizing that all modern humans are of mixed origins, proposed the interbreeding hypothesis almost a century ago in 1907, in his article Race studies in Denmark. And since then dozens and dozens of articles and science papers have been published debating the pro and con on the interbreeding hypothesis. For examples on the most recently published pro-articles, see – 1999, 2001, 2006 and 2007 – which were published years before Meier’s alleged conversation with ET on August 11, 2008. As a side note, in 2010, strong evidence for the interbreeding hypothesis came in the form of DNA analysis. …It deals with the statement that gigantic masses of ice can melt away on Earth because of the climate change and the Sun’s influence, through which the tremendous pressure, caused by the ice, may have the effect that the earth is arching up and probably may increase its rotation. Obviously, certain people have taken it the wrong way, because they have gone through the wrong because they mock that the rotation speed slows through such a process. Of course once again it is a case of scientifically „Angehauchte“ (no expression in English) who, on the one hand are understanding everything falsely, and, on the other hand, do not reach the point of that what is the issue, because they are lacking the necessary intelligence. That claim is nonsensical, because if Earth would slow down its rotation speed through the melting process of the ice masses, the „arching-up“ of the earth would have to reach above the height of the melting ice. This means, that the „arching up“ of the earth in its mass, weight and scope would have to be greater than the melting ice mass. This will not be the case, however, if there will really be such a gigantic melting of ice world-wide, which does not correspond to a prediction, but to a possibility only. If the enormous melting of the ice should really become a reality in apocalyptical dimensions worldwide, the „arching-up“ of earth will be very minimal and calculated within the range of a few metres, while the ice masses have to be measured hundreds and thousands of metres in thickness. This means that although the „arching-up“ of the underground, on which the ice is melting away, Earth’s outer total circumference is reduced, through which an increased rotation speed of the planet can result. But for the time being this is just a thesis and possibility and, therefore, nothing from which a prediction or probability calculation could be made. It is very clear though, that those people are thinking unrealistically and do not understand the whole thing in the meaning of the possible facts, who are mocking about that which we have discussed as a thesis and possibility regarding the worldwide melting of the ice and the resulting effects. Even a human being who does not understand the matter can confront himself with that which we have discussed in his thoughts to the extent that he grasps that the „arching-up“ of a surface can be only as great (high) as corresponds to the original extent/height, before something heavy lies on it and the surface is pushed in. If the pressure and the dent resp., that result from an enormously heavy weight, disappear from a surface, then the pushed-in surface returns to its original state. And then that’s the „arching-up“ through which Earth returns to its real circumference which is somewhat shorter without the gigantic ice masses, which then can or could lead to an increased rotation movement. That’s the meaning of that which has been explained. Here, both Meier and Ptaah assert that when the gigantic masses of ice in the polar regions melts due to climate change, the Earth’s rotation would speed up and not slow down as claimed by “certain people” who are “lacking the necessary intelligence.” They both discussed this same topic earlier in CR 476, Tuesday, February 3, 2009. Could the melting of ice at the poles affect the tilt and rotation of the Earth? Melting ice from polar regions is one of numerous processes that affect the speed of Earth’s rotation, said James Davis, Lamont Research Professor at the Lamont-Doherty Earth Observatory of Columbia University. It also affects the tilt of the axis of rotation, by about one degree per million years, he said, and NASA has measured alterations in the gravity field as well. This net mass shift slows the Earth’s spin rate, just as a spinning ice skater pushes out her arms to slow down, Dr. Davis said. That has the effect of lengthening the day: Recent calculations indicate that loss of mass in Greenland and the Antarctic makes the day about 0.6 milliseconds longer per century. At the same time, however, Earth is still changing shape in response to the massive melting from 23,000 to 10,000 years ago — coincidentally decreasing the day by about the same 0.6 milliseconds per century. The same has also been confirmed in another more recent study – Rising Sea Levels Are Making the Days Longer – published in December 2015. For a more detailed information (calculations) on how this effect comes about, check out this 1999 article. This basic scientific fact is in direct contradiction to the claims made by Meier/ETs. Has Meier been mistakenly “inspired” by this 2007 article – Warmer waters could spin the Earth faster, whose conclusions are however based only on the effects of warming waters on the Earth’s spin and not the melting of ice caps? … Well, to something different: Already, at various times, we privately spoken about the volcano at La Palma, and certainly already in 1975 on my Great Journey. Already at that time I told some people about that, as I also have in recent years, for which reason I have now already been repeatedly asked whether you could say something more specific regarding what could one day occur there, because certainly the west flank of the volcano is unstable and can break away and cause a catastrophe. Can you therefore say something further regarding this please? I could do that but it is certainly better if I call up our private conversation for you which we had in relation to this during your Great Journey. You mean you still also have recordings of that time when we privately discussed so many things which were naturally not reproduced in the contact reports? Of course. At that time you already made enquiries in relation to the Cubre Vieja Volcano at Las Palmas. I remember that and I did mention it. Patience brings roses, but first it brings buds. Your question concerns the Cumbre Vieja Volcano on the Island of La Palma. The western part of the volcano, the west flank, as you correctly say, is extremely unstable and can slip into the Atlantic in the coming time and cause an enormous tsunami. But the east side of the volcano is also at risk, especially if a strong volcanic eruption occurs, as is also the case with the western flank. The reason for that lies in the fact that the volcanic mountain is internally very porous and so saturated with water that, with a strong eruption, the water can suddenly vaporise and rip the volcano apart due to a steam explosion. I do not want to talk of a certain time in relation to when that can happen or will happen, as it does not lie in my authority to name dates about that, because this belongs in the domain of terrestrial scientists and governments who, in regard to necessary measures, have to make determinations which I am not permitted to influence. Besides, the entire thing can be prevented if the correct measures are taken which consist of a systematic, “quiet” dismantling of the part of the volcano, which is at risk. And if it is not dealt with in this manner then a catastrophe is unavoidable if it does not naturally occur that, by and by, only a small part of the side of the volcano, which is at risk slips away. That will certainly happen again and again in the coming time, but to what extent the danger is thereby lessened is questionable. But the fact of the matter now is that an enormous part of the west flank of the Cumbre Vieja Volcano can slip, plunge into the sea and, within a few minutes, cause a gigantic wave of water, respectively, a giant tsunami, which can reach a height of up to 1,500 or even up to 2,500 meters or even more, and indeed according to the mass and speed of the falling material as it slips from the flank of the volcano. As a result of this – if it really happens, which is not yet established – the surrounding Canary Islands would be flooded with 50 to 150 meter high waves and everything there would be destroyed, after which the gigantic waves would also reach Africa. If it really happens in the aforementioned manner then the giant wave would spread out across the Atlantic in a semi-circular form and indeed in several waves of various sizes and would speed through the ocean at 1,000 kilometres an hour, to – after around eight hours – reach the coast of the USA where it would cause the water of the Atlantic to rise up to a height of 100 meters and more, depending on the shape of the coastline in each place, and bury everything on the solid land under itself. The effects of the giant tsunami would also destroy the coasts and much in the interior of South America. England would also be effected by it as also would Greenland and the coastal areas of all of Western Europe. This is the worst case scenario, if the entirety of the western flank of the volcano slipped all at once and plunged into the sea. If, however, only small parts of the side of the mountain loosen and plunge into the sea, the results would naturally be correspondingly lessened. All the above linked articles suggest that the threats of mega-tsunami were not new and more over suggest that most of the threats are over-hyped and not real. Also there is no evidence other than Meier’s own claim that he has send leaflets to geologists,..etc in or after July 1975, warning about the potential mega-tsunami originating from the collapse of the western flank of the Cumbre Vieja volcano. Why did Meier not discuss or publish this “major threat” anywhere in his earlier 480 official contacts with ETs or in other periodicals like Stimme der Wassermannzait, since 1975 (the year when he was allegedly informed about it for the first time)? Also why did Meier and Plejaren file this under ‘private conversation’ instead of publishing it in contact reports so that the public can be made aware of it which could potentially save uncountable lives and property? If Meier did send leaflets about this “major threat” to dirverse geologists..etc, then what is the point of keeping it private and not making it public since 1975 and up to the time of this 481st contact (2009)? Would scientists be convinced from a leaflet, carrying a forecast for the worst-possible natural disaster with no scientific documentation, sent in 1975 by a man claiming to be in contact with Aliens?